The General Data Protection Regulation (GDPR) is a regulation in EU law regarding data protection and privacy for European Union citizens. It states that brands in control of personal data, must be able to honor, within one month, requests for access, portability, rectification and erasure. With regard to mobile attribution, since it is impossible to know in advance which users are European citizens, GDPR applies to all mobile users, European or not. To address and manage requests from data subjects, as required for GDPR compliancy, AppsFlyer, along with mParticle, Amplitude and Braze, have initiated the OpenGDPR protocol. OpenGDPR is a unified, open-source framework, facilitating cooperation between technology companies for the fair and transparent use of consumer data. It enables vendors to easily take data privacy actions across multiple systems to process and store customer data. Data Controller The advertiser determines the purpose and means by which the personal data is processed. GDPR details the mandatory rights of the data subject, with which the advertiser must comply. If requested, data subjects have the right to know if, why, and for how long the data controller will be processing their data. If data is shared with third parties (like AppsFlyer), data subjects have the right to know who those third parties are. The right to know what categories of data are being processed. If there is automated processing, that has a significant effect on them. When sending an ‘access’ request, Data controllers receive a copy of the Data Subjects’ processed personal data. The Data Subject needs to receive all of their personal data in a structured, commonly used and machine-readable format – such as a CSV file. When sending a ‘’portability’ request, Data controller receives a copy of the Data Subjects’ processed personal data. Allows Data Subjects to correct their data if they see it is inaccurate or untruthful. Data controllers then have to erase or fix inaccurate or incomplete data. When the data controller submits a ‘rectification’ request, AppsFlyer deletes the data subject's past data up to that moment, but data received afterwards is updated by AppsFlyer. The right of erasure forces data controllers to remove the personal data within one month. Advertisers can delete the collected data of data subjects with an ‘erasure’ request. GDPR Request - Perform one of the above request types: 'access', 'portability', 'erasure' or 'rectification'. It is up to the data controller to implement GUI changes, so that its end users can submit these requests. Note that GDPR requests are per one user at a time. Data subject (end user) submits a request. Data Controller (advertiser) constructs the GDPR request (see below) and sends it to AppsFlyer. Data Processor (AppsFlyer) receives the request and responds with "201 OK" for valid requests. In the next 48 hours the request is queued in pending status, and may still be cancelled. Afterwards, the request status changes to in_progress, and AppsFlyer sends a ‘status change’ postback. The request CANNOT be cancelled from here on. a) AppsFlyer fulfills the request during the next 28 days. In the case of ‘erasure’ / 'rectification' - the end user's data is deleted. In the case of ‘portability’ / ‘access’ - the end user's data can be accessed in AppsFlyer’s dashboard under GDPR section, or via the Request API (see below). b) The request changes status to completed, and AppsFlyer sends a ‘status change’ postback. The API token is the same API token used for pull API. You can retrieve from your dashboard under API Access. subject_request_id REQUIRED UUID v4 string. This must be generated by the controller at the time of request submission to a Processor. It can then be used in order to check the status of the request, update or cancel it. subject_request_type REQUIRED String value representing the type of GDPR Request. Supported values: "erasure", "portability", "access" and "rectification"
subject_identities REQUIRED Array of Identity Objects covering the type, value and format of the device ID (see below). Each request can only have one device ID. status_callback_urls OPTIONAL Array of endpoints for status callbacks to be sent to following request status changes. Note that ONLY https endpoints are supported. A GDPR request MUST contain one or more Identity Objects used to fulfill the request. identity_type - REQUIRED string value representing the form of identity. The supported Identity Types by AppsFlyer are ios_advertising_id, android_advertising_id, fire_advertising_id and microsoft_advertising_id. identity_value - REQUIRED string value representing the identity. identity_format - REQUIRED string value representing the encoding of the identity. Currently raw is the only supported Identity Format by AppsFlyer. install using pip install requests """
As described in the GDPR Request Flow above, when the status of a GDPR request changes, from pending to in_progress to completed, AppsFlyer sends a GDPR postback to the requesting endpoints, specified with the status_callback_urls property. The generated report is available for seven days from the time of completion. It is possible to cancel a GDPR request, based on its subject_request_id, but only during the pending phase. When a GDPR cancellation request is received, AppsFlyer returns an HTTP response with status code 202 and several other parameters. For more details check the GDPR "Cancellation Response Properties" chapter. 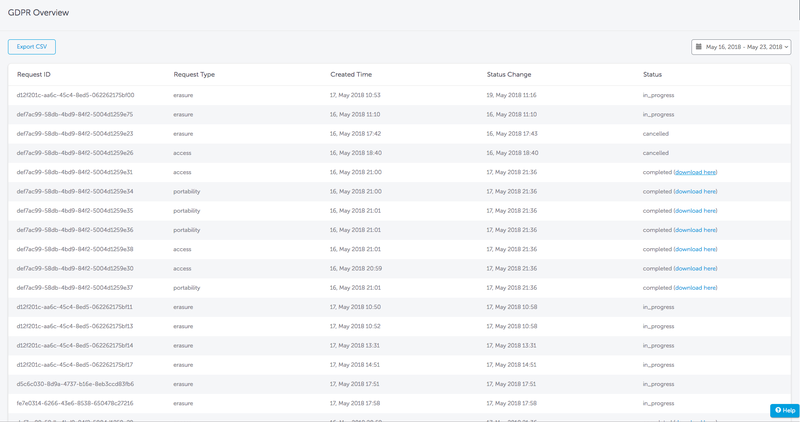 Once the cancellation of the request takes place AppsFlyer sends a postback with the cancelled status. This AppsFlyer’s API is a test API for the AppsFlyer’s GDPR Requests API. 1. Once a GDPR request has been made, the request is immediately placed in ‘Pending’ status. For testing purposes the status changes every 30 seconds. 2. If an endpoint for a status postback has been inserted in the GDPR request, a first postback is sent right after the request and two more status postbacks are sent in 30 second intervals. A valid API token must be inserted with the request. In the ‘property_id’ property, the App ID must belong to the account owner (according to the API token). All GDPR requests submitted are available to be viewed in the Logs Dashboard by account owners only. For completed access and portability requests, it is also possible to download the report from within this dashboard. 1. Go to the main dashboard and click your user name. All data subjects have the Right to Restriction of Processing of their data. When data subjects exercise this right, data controllers must stop processing the subjects’ personal data under all circumstances, including removing the users from all direct marketing. To shut down all SDK tracking on a mobile device use the isStopTracking API. Once this API is invoked, AppsFlyer's SDK stops functioning and no longer sends any information to AppsFlyer's servers. Details for developers is set out below. Available from Android SDK v. 4.8.7. In any event, the SDK can be reactivated by calling the same API, but to pass false. Use this API only in cases where you want to fully ignore this user from any and all tracking. Using this API SEVERELY impacts your reporting and attribution. Available from iOS SDK v. 4.8.3. For additional information on SDK Implementation click for Android, iOS or Unity.